You probably remember the Smart Reply feature that devices with Android Wear have. 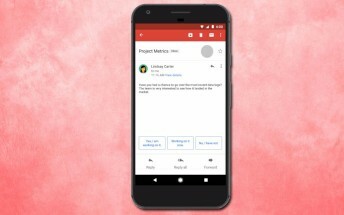 Google announced at its I/O keynote that the machine-learning process for replying emails will be implemented in Gmail for Android and iOS. Smart Reply scans the text of the incoming message and offers you three basic responses in English. According to Google, Spanish will also be available “in the coming weeks” and other languages should follow soon. The company says Smart Reply will learn over time and will adapt to your vocabulary, so the responses should become more and more personalized with time. Google also promises the data is stored on your device and the respondent will not see the suggestions.